can help you keep track of everyone. The firm identified that it needed a more advanced, cloud-based meeting room booking & visitor management system capable of managing the complete ‘visitor journey’ with easy-to-follow procedures. From booking a meeting to arrival and departure ... and all touch points in between. 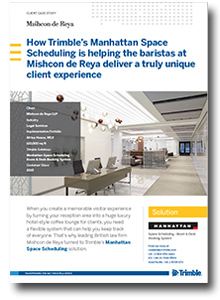 Download the case study today to learn more about why Mishcon de Reya selected Manhattan Space Scheduling and how the software has improved the room booking and visitor experience.